Kamchatka and the Kuril Islands are home to 36 active volcanoes with yearly explosive eruptions that eject ash to heights of 8 to 15 km above sea level, posing hazards to jet planes. 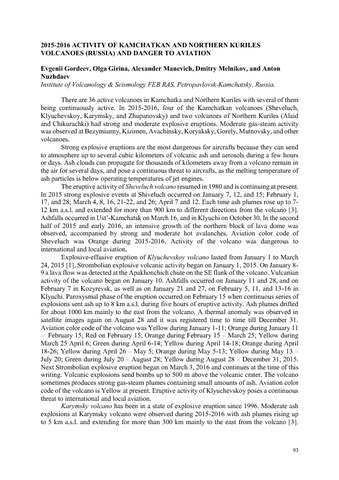 In order to reduce the risk of planes colliding with ash clouds in the north Pacific, the KVERT team affiliated with the Institute of Volcanology and Seismology of the Far East Branch of the Russian Academy of Sciences (IV&S FEB RAS) has conducted daily satellite-based monitoring of Kamchatka volcanoes since 2002. Specialists at the IV&S FEB RAS, Space Research Institute of the Russian Academy of Sciences (SRI RAS), the Computing Center of the Far East Branch of the Russian Academy of Sciences (CC FEB RAS), and the Far East Planeta Center of Space Hydrometeorology Research (FEPC SHR) have developed, introduced into practice, and were continuing to refine the VolSatView information system for Monitoring of Volcanic Activity in Kamchatka and on the Kuril Islands during the 2011–2015 period. This system enables integrated processing of various satellite data, as well as of weather and land-based information for continuous monitoring and investigation of volcanic activity in the Kuril–Kamchatka region. No other information system worldwide offers the abilities that the Vol-SatView has for studies of volcanoes. This paper shows the main abilities of the application of VolSatView for routine monitoring and retrospective analysis of volcanic activity in Kamchatka and on the Kuril Islands. 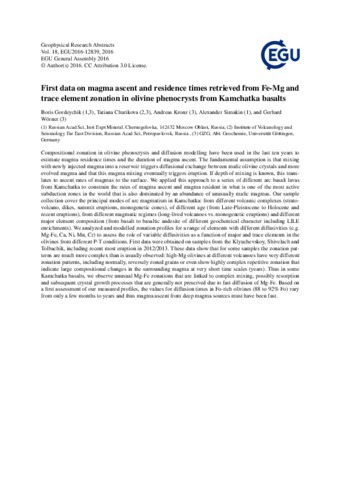 Compositional zonation in olivine phenocrysts and diffusion modelling have been used in the last ten years to estimate magma residence times and the duration of magma ascent. The fundamental assumption is that mixing with newly injected magma into a reservoir triggers diffusional exchange between mafic olivine crystals and more evolved magma and that this magma mixing eventually triggers eruption. If depth of mixing is known, this translates to ascent rates of magmas to the surface. We applied this approach to a series of different arc basalt lavas from Kamchatka to constrain the rates of magma ascent and magma resident in what is one of the most active subduction zones in the world that is also dominated by an abundance of unusually mafic magmas. Our sample collection cover the principal modes of arc magmatism in Kamchatka: from different volcanic complexes (stratovolcano, dikes, summit eruptions, monogenetic cones), of different age (from Late-Pleistocene to Holocene and recent eruptions), from different magmatic regimes (long-lived volcanoes vs. monogenetic eruptions) and different major element composition (from basalt to basaltic andesite of different geochemical character including LILE enrichments). We analyzed and modelled zonation profiles for a range of elements with different diffusivities (e.g. Mg-Fe, Ca, Ni, Mn, Cr) to assess the role of variable diffusivities as a function of major and trace elements in the olivines from different P-T conditions. First data were obtained on samples from the Klyuchevskoy, Shiveluch and Tolbachik, including recent most eruption in 2012/2013. These data show that for some samples the zonation patterns are much more complex than is usually observed: high-Mg olivines at different volcanoes have very different zonation patterns, including normally, reversely zoned grains or even show highly complex repetitive zonation that indicate large compositional changes in the surrounding magma at very short time scales (years). Thus in some Kamchatka basalts, we observe unusual Mg-Fe zonations that are linked to complex mixing, possibly resorption and subsequent crystal growth processes that are generally not preserved due to fast diffusion of Mg-Fe. Based on a first assessment of our measured profiles, the values for diffusion times in Fo-rich olivines (88 to 92% Fo) vary from only a few months to years and thus magma ascent from deep magma sources must have been fast. Shiveluch volcano located in northern Kamchatka erupted mainly high-Mg andesites during Holocene times. However, tephrochronologists found two Holocene tephra layers that are unusual for this volcano: a high-Mg middle-K basalts with an age of 7600 yr BP and high-Mg high-K basalt with an age of 3600 yr BP [Volynets et al, 1997]. The proximal outcrops for these two tephra deposits were discovered just recently [Churikova et al., 2010; Gorbach & Portnyagin, 2011]. Our study of olivines from the high-Mg basalts documents unusual Mg-Fe zonation [Gordeychik et al., 2016]: Inner cores of olivines from both eruptions show Fo87-92, falling to the rim to Fo75-85. In the outer cores of both basalt tephra, forsterite decreases linearly abruptly changing to a steeper gradient towards the rim. Electron microprobe element maps reveal the complex and highly unusual zoning features of these olivines. The inner cores of the olivines of 7600 yr BP tephra have bell-shaped distributions for forsterite and nickel. The maximum forsterite in their core can be up to Fo92, decreasing outward to the outer core to Fo86. At the same time, the trace elements in the inner core remain constant. Such element distribution is consistent with diffusion of Fe, Mg, and Ni in the initially uniform high Mg cores after the phenocrysts were changed to non-equilibrium in a less mafic melt. The shape of the inner cores suggests partial dissolution after magma mixing. The interfaces between the inner and outer cores are marked by abundant melt/fluid inclusions. The inner cores were overgrown by olivine with Fo90 when the crystals moved to the high-Mg melt. As result some olivine grains have the maximum forsterite values in the outer core. The specific feature of the olivine outer cores from basalt of the 7600 yr BP tephra eruption are concentric zones with higher values of Ca, Cr, Al, P. One of the crystals has five distinct growth zones with high Cr concentrations. The width of these zones can be only a few microns and thus such zones are often missed in typical quantitative point measurements in microprobe profiles. Inner cores of olivines from the 3600 yr BP tephra are uniform in forsterite and nickel. However, Al and Ca element distribution maps show in inner cores higher concentrations with rather smooth contours. This suggests that initially the olivines were formed from high-Al and high-Ca melt, then were dissolved and the overgrowth zonation has been smoothed out due to faster Mg-Fe diffusion. Only Ca and Al with low diffusivity were conserved. The concentric zones with higher element concentrations are not so well expressed in olivines from the 3600 yr BP tephra, but some distinct growth zones are also shown in Ca, Cr, and P.
Information extraction and decoding of the elemental maps allow seeing highly complex growth-dissolutiondiffusion history of magma mixing processes prior to eruption. This research was supported by RFBR-DFG grant # 16-55-12040. 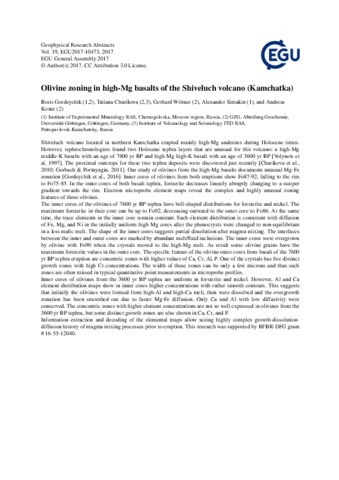 The deep structure, Wadati-Benioff zone (focal zone) geometry and the magma feeding system of Shiveluch volcano are investigated based on 1962–1994 detailed seismic surveillance. A focal zone beneath Shiveluch is dipping at an angle of 70° at depths of 100–200 km. Based on the revealed interrelations between seismicity at depths of 105–120 km and an extrusive phase of its eruptions in 1980 through 1994, it is inferred that primary magmas, periodically feeding the crustal chamber, are melted at depths of at least 100 km. An upsurge of extrusive-explosive activity at the volcano is preceded and accompanied by the increasing number and energy of both volcanic earthquakes beneath the dome and tectonic or volcano-tectonic earthquakes in the zones of NW-striking crustal faults near the volcano.The eruption of April 1993 has been the most powerful since 1964. It was successfully predicted based on interactive use of all seismic data. At the same time the influence of seismicity at depths of 105–120 km under the volcano on the style (and consequently on prediction) of its activity is decisive.